I'd not been to Edinburgh since 1990, when I was 20 years old and pregnant, and my thoughtful studying abroad brother imported me for the UK for Spring Break to get my mind off being a 20 year old pregnant college student who was having a very difficult time deciding what to do about being a 20 year old pregnant college student. I enjoyed that visit quite a lot, but I don't remember Edinburgh being quite so ... lively. And Sunny! And full of everything a easily pleased yet slightly snobbish and gustatorially-oriented person could ever want. It is my new favorite city. Look at the goods from my host friend's corner bakery! 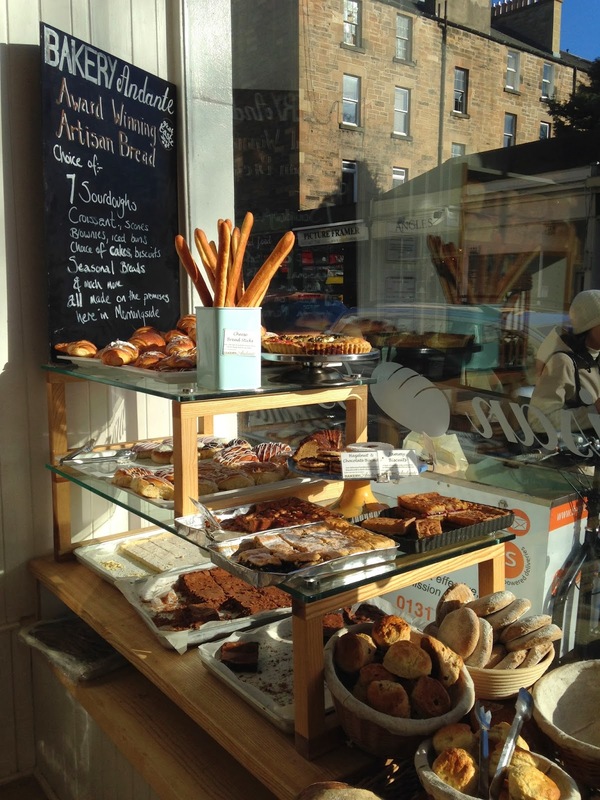 An endless selection, including Leo's favorite butter croissants. All freshly and perfectly baked, as top-notch as anything you might find in San Francisco (and the scones were better, natch). The Farmer's Market's live music was also world-class. My damn iPhone was too full for video. Iz would have been pleased, I think -- she does love her music. Especially music that she finds first. 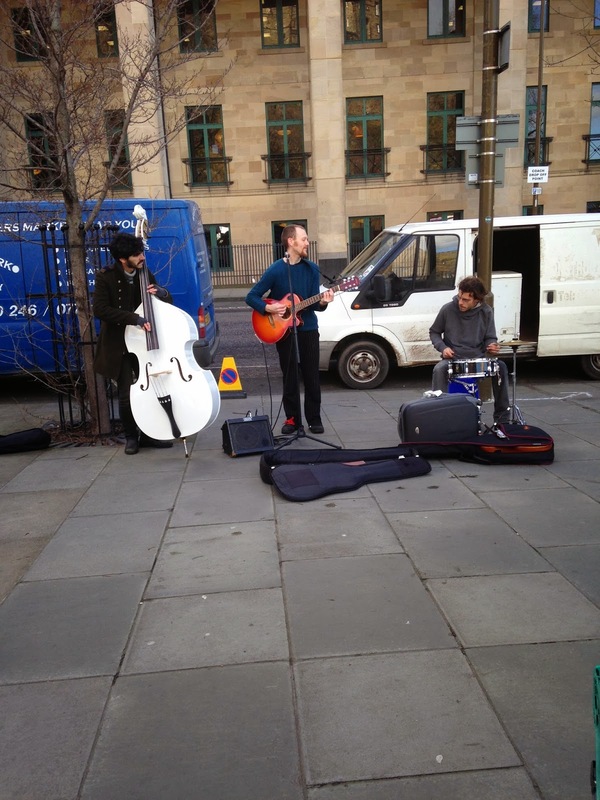 And I doubt any friends back home would know these buskers. Too bad I'm on the front end of a business trip and so did not bring my family (my husband actually suggested I build out the front end of my UK business trip into a holiday, so I don't feel as bad as I might about not bringing the rest of the crew this time). 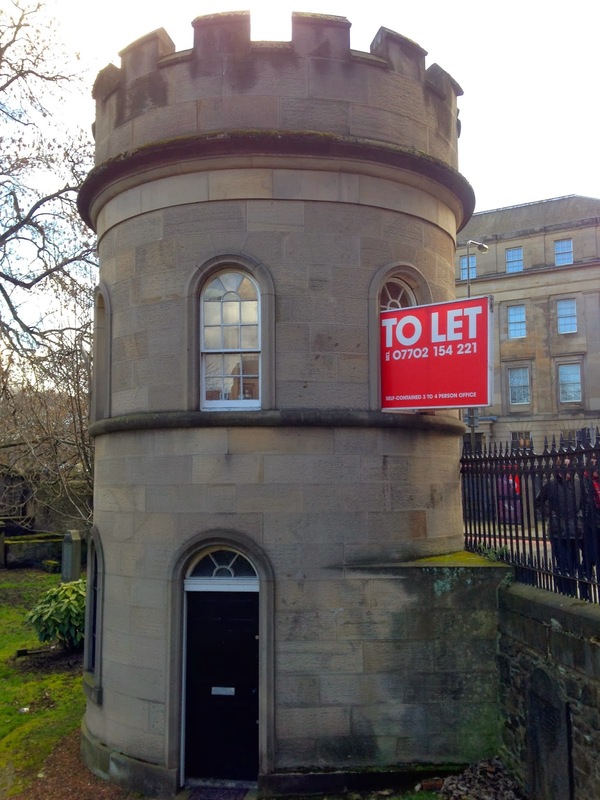 My hosts and I considered letting this turret in St. Cuthbert's, also in the shadow of The Castle. Who wouldn't. Right? The weather was very very very very good, even atop the Castle where it was slightly windy. Everyone warned me UK weather at the end of February/start of March would be crap. But we experienced gloriously sunny, if chilly, days the entire weekend I stayed. Not to mention glorious views. Of ancientness. Everywhere. Ancient exists in California, but it is rarely so tangible and certainly not as omnipresent as it is in Edinburgh. This is my obligatory Mon's Meg (a famous cannon) shot from the Castle. It is one of many, many, many military exhibits in the castle. My brother, who is a military historian as well as a Warner Brothers cartoons expert, gave me a comprehensive tour of those exhibits during our last visit, and as it wouldn't be the same without him, I did not visit those museums. However as there are very few words that rhyme with my name I rarely resist a shot (heh) like this one. 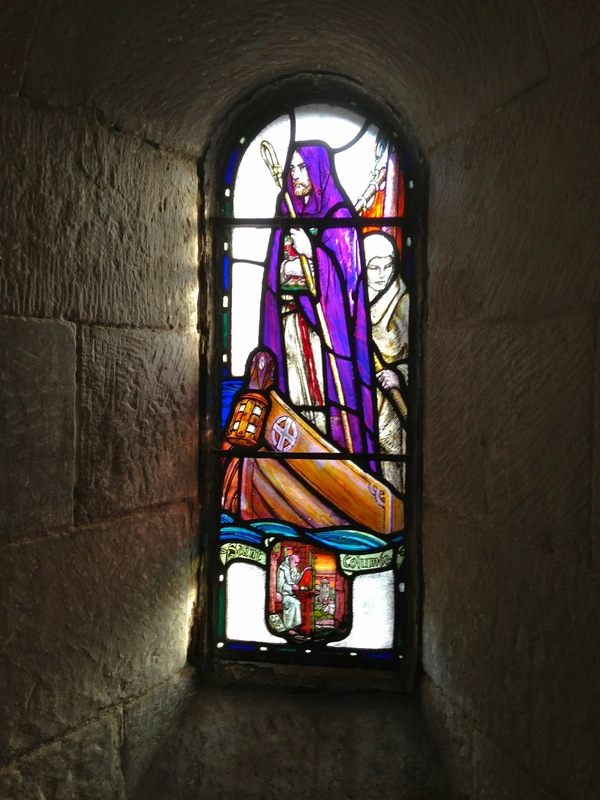 St. Margaret's Chapel, also part of the Castle, was built in the 12th century by King David I in honor of his mother. You have to love a boy who loves his mummy. Most of the castle is not terribly accessible, though significant effort has been made to convert those parts that can be converted. I did like that they included touchable models with braille descriptions of some of important objects in the exhibits, such as the Sword of State (one of the Honours of Scotland, and part of the Crown Jewels exhibit). I also appreciated the affability of the very well informed docents. 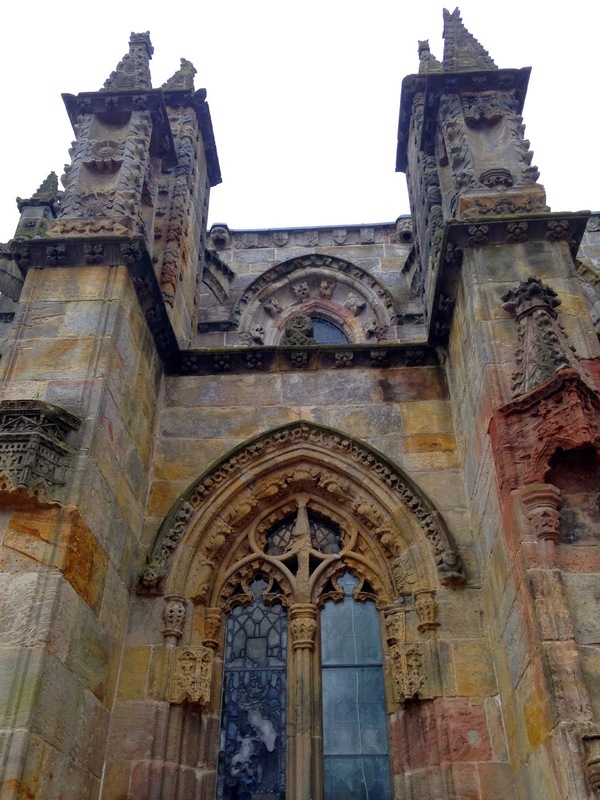 Did you know that Scottish kings often shared the throne if there were multiple eligible brothers, so that they did not kill each other over the crown? Robert the Bruce ended that era of reasonableness, though. And, ho, geeks! 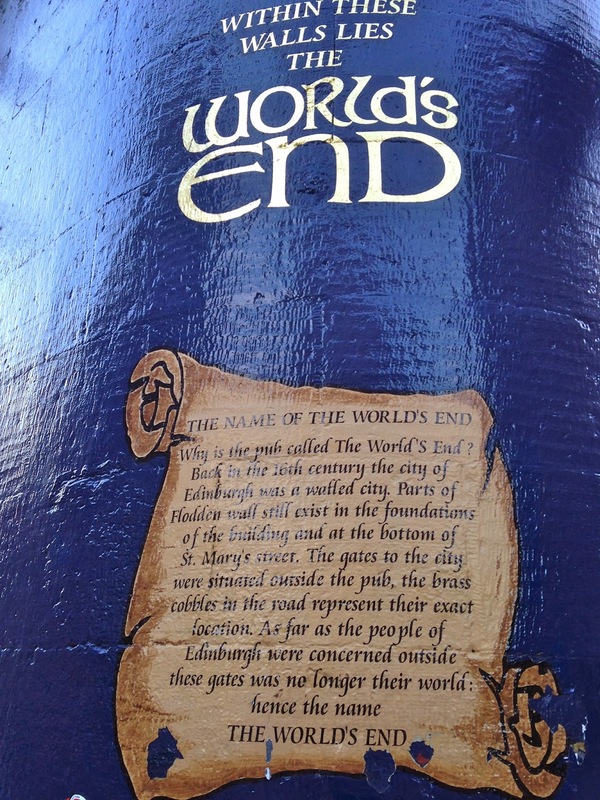 On The Royal Mile below the Castle lies The World's End pub, so named because when it was founded, it was the last pub before the Edinburgh city wall, and anything outside the wall didn't matter to the snobs insde -- so the pub was literally considered The World's End. Though I actually preferred the food and drink at the Tollbooth Tavern just lower on the Royal Mile. 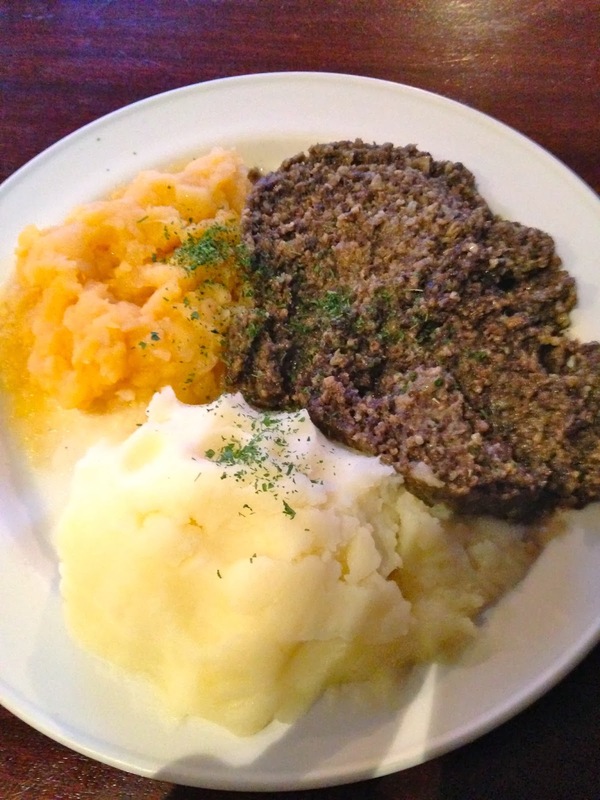 I did not get bonked on the head by the resident ghost, but I did find the perfect bitter but not too hoppy ale in The Flying Scotsman, and I am officially a haggis convert -- this plate of Haggis, Neeps (turnips), and Tatties (potatoes) is my new standard for comforting comfort food meals. Though I'm not sure where I'll find a good sheep's stomach to nibble on once I'm back home. 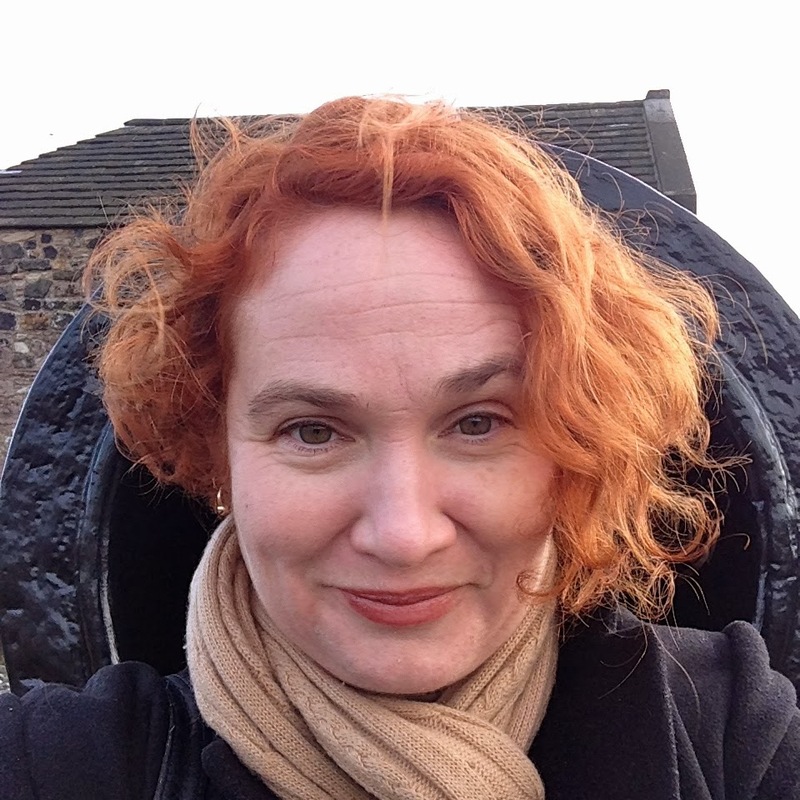 Back to the greatness that is Edinburgh -- my gracious, affable, brilliant, witty host and I did not have to walk more than a few short blocks from her street to find everything a person like me (and my husband) might want. Pehaps we will move here instead of San Francisco when our children leave home, because I would not mind living a stone's throw from a French deli that provides fresh goose rillette, a South African cafe that serves perfect coffee, and an Oxfam used book store (where we stocked up on several of the Horrible Histories titles that are not available in the US but which my host's children recommended as being just perfect for Mali and her similarly irreverent friends). 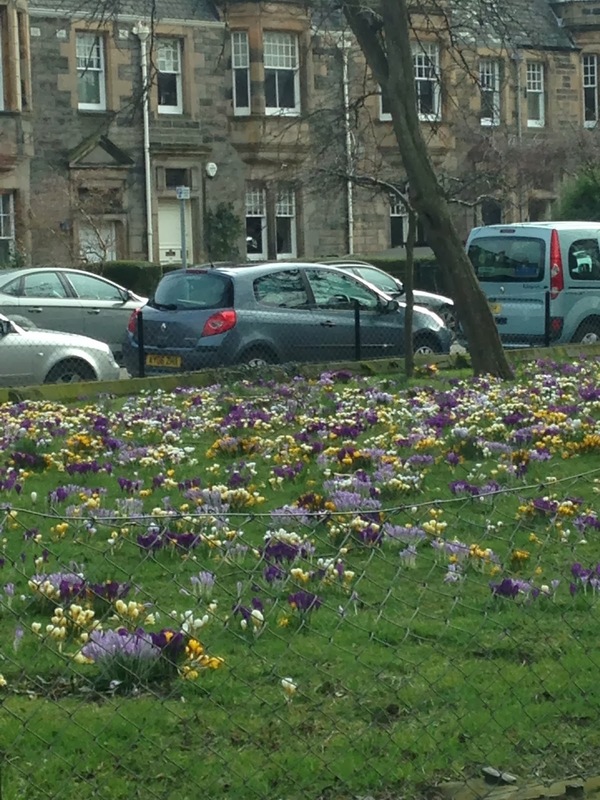 I also wouldn't mind being greeted with carpets of purple crocuses, white snowdrops (which I'd only ever heard of from British children's literature), and miniature yellow daffodils everywhere we looked. Edinburgh was such a delight that I occasionally wondered if my host had pulled a Potemkin Village on me. Then I started thinking that perhaps Iz should go to Edinburgh University so we really would have a reason to come visit again. 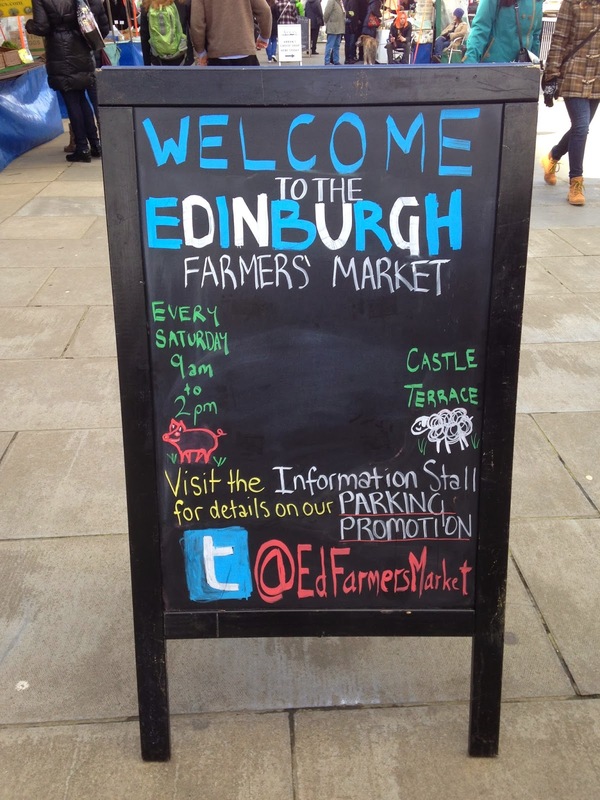 So if you get the opportunity to visit Edinburgh? Do it. Shannon, thank you for the lovely pictures and commentary! I haven't been to Edinburgh or even Scotland since 1977. It's a magical place-- I need to find my traveling shoes! Oh, I highly highly recommend it! I haven't been to Scotland since.... 2007-ish, when I went for a two-week summer course on creative writing in the middle of festival season. it was AWESOME!! but you got into the the End of the WORLD!!! I'm jealous!! I love Edinburgh!!!! I miss Edinburgh so much! I got to go once in 2004 for the Fringe Festival and have been looking for someone to take me back ever since. Definitely one of my favorite cities in the world.